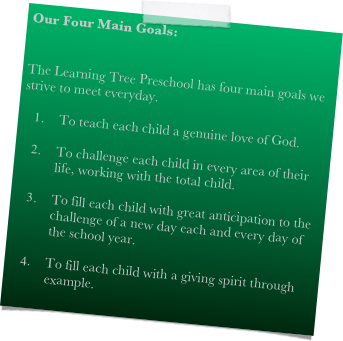 The main purpose of the Learning Tree Preschool is to provide an all-day center for children of mothers and fathers working outside of the home, while providing an organized, creative, constructive, literacy-filled, and challenging learning program in a nondenominational Christian, home-like atmosphere. 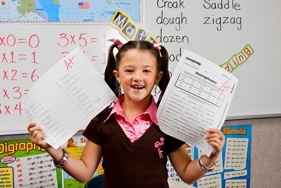 The classroom is developed into a “prepared environment” which excites and challenges the child’s intellect. The classroom is a fascinating world of concrete material, to encourage the child to explore, touch, create, learn, and communicate. The atmosphere is Montessori-oriented, allowing freedom with responsibility, emphasizing the development of “inner discipline” rather than the use of outward controls.